Dr. Bibiano Fajardo explains the Hilot areas on the back. 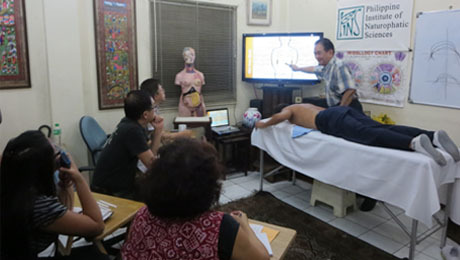 Pasig City, Philippines- On August 22, 2013, the first batch of students completed the first trimester of Comprehensive Traditional Hilot, one of the requisite courses towards a degree in naturopathic medicine. This pioneering ladderized degree in naturopathy was brought about by the tripartite partnership forged by the Philippine Institute of Naturopathic Sciences (PINS), the Family Life and Wellness Institute (FLWI), and the Makati Medical Center College (MMCC). 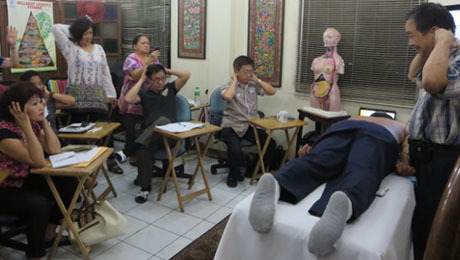 More than half of the first batch of students of Comprehensive Traditional Hilot were in the medical field, joined by practitioners and enthusiasts of other natural healing modalities. The course was taught by Dr. Bibiano Fajardo, practitioner of Hilot and the Philippine healing arts for over 40 years, and the main proponent of Hilot as a scientific healing modality. Most of the students have had prior experience with Hilot, in varying degrees. When asked why they enrolled in the course, most students replied that they wanted to know what Hilot was all about. One of the students, a nurse, shared that she had been encouraged by her husband, because he himself had been waiting for a long time for Dr. Bibiano “Boy” Fajardo to teach what he knew about Hilot and the Philippine traditional healing arts. That Hilot is just a Filipino form of massage is a common view held by many Filipinos, and was reported by some members of the class as their own perception of Hilot before taking the course. Another common view of Hilot, shared by another student, is that Hilot is associated with kulam (curses) and other equally mysterious doings of albularyos (traditional healers). Students of Comprehensive Traditional Hilot try to look for the points demonstrated by Dr. Fajardo. After the first trimester, all students professed a change in how they viewed Hilot. Some of them enthusiastically noted the depth and range of Hilot, and how there is so much to learn about it. Others thoughtfully observed Hilot’s holistic approach to healing, and claimed a broader understanding of traditional techniques used by Filipino healers. When asked what was the most important thing that they had learned so far in the Hilot course, the students shared a variety of responses, reflecting their diverse backgrounds and inclinations. One appreciated learning about the “secrets” behind Hilot, which before, only traditional healers knew and were privy to. A student, who is into pranic healing, signified that the most important thing she learned was respect for all healing modalities. She, together with other spiritually-inclined students, also emphasized the Valuing Process, a technique for harmony and change, which was introduced in the course. Still other students emphasized the need to balance the four elements of the physical body and harmony with the universal energy for maintaining health. On a more practical aspect, for one student, the most important thing that she learned was another possible cause of back pain. Meanwhile, the medical doctors cited traditional Hilot diagnosis and treatment as the most important thing they learned. However, despite the diversity of responses about the most important thing they learned, the students were unanimous in that they wanted to continue learning Hilot, not only because it is required for the course and they found it interesting, but because ultimately, they would like to apply what they learned about Hilot in their daily lives and in their practice of healing. is there a certain Hilot that is beneficial to pregnant women or are all Hilots good for pregnant women ? In our office, we generally avoid doing Hilot on pregnant women, especially those in their first trimester. However, if it is really needed and the condition does not involve pregnancy-related areas (for example, the client has asthma) we will do Hilot, but we carefully avoid all areas and points on the torso and extremities that have to do with the reproductive system.